The Office for National Statistics has released the September Labour Market Statistics today. Unemployment in Scotland increased by 13,000 to 231,000, according to Office for National Statistics (ONS) data released today. The Scottish unemployment rate is 8.6 per cent, above the UK average unemployment rate of 7.7 per cent. The labour market statistics also show employment in Scotland has increased by 10,000 over the previous three months. The number of those in employment in Scotland now stands at 2,452,000. “This Government is more determined than ever to achieve sustainable economic growth for all parts of the UK. The coalition government is taking real steps to ensure we create a secure economy which in turn creates long-term, quality jobs. “I welcome the news the number of people receiving Jobseeker’s Allowance fell last month. A lot of work is needed to create a long-lasting labour market recovery and we have already begun that task. “Only a balanced economy will guarantee the necessary investment for new jobs. The Spending Review is a crucial stepping stone on the way to recovery. It is not just about cuts and tackling the deficit, but laying the groundwork for future growth. Employment in Scotland increased by 10,000 over the quarter, and fell by 53,000 over the year to stand at 2,452,000. 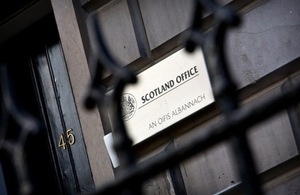 The Scots employment rate increased by 0.2 percentage points over the quarter to 70.3 per cent. The rate is below the UK average of 70.7 per cent. Unemployment in Scotland rose by 13,000 over the quarter. The level now stands at 231,000. At 8.6 per cent, the Scots unemployment rate is higher than the UK figure of 7.7 per cent. Economic Activity level increased by 23,000 over the quarter and now stands at 2,683,000. The Economic Activity rate rose over the quarter, and stands at 77.1 per cent. In September 2010, the number of people out of work and claiming Jobseekers Allowance (JSA) was 134,500. This represents a fall of 1,100 over the month and is the sixth fall over the last eight months. The Labour Force Survey (LFS) indicates that the number of people in employment in Scotland from June - August 2010 was 2,452,000. Employment was up by 10,000 compared to the previous three months and down by 53,000 compared to the same period last year. The employment rate increased by 0.2 per cent over the quarter, and fell 1.6 per cent over the year, to 70.3 per cent. In comparison, the Scottish employment rate is below the UK average. Unemployment in Scotland was up 13,000 over the quarter June - August 2010, to 231,000. The level was up 37,000 compared to the same quarter last year. The unemployment rate was up 0.4 p.p. from the previous quarter to 8.6 per cent, which is up 1.4 p.p. over the year. The claimant count in Scotland, based on the seasonally adjusted number of people claiming Job Seeker’s Allowance (JSA), fell by 1,100 from August, to 134,500 in September 2010. The level is up by 1,900 on September 2009. The claimant count rate is unchanged over the month at 4.8 per cent, up 0.1 p.p. over the year. The number of economically active (defined as those in employment or ILO unemployed, seasonally adjusted) in Scotland in the June - August 2010 quarter was 2,683,000. This was up 23,000 on the previous quarter, and a fall of 16,000 on the same point a year ago. Among those aged 16-64, the economic activity rate was 77.1 per cent, up 0.5 p.p. on the previous quarter, and down 0.5 p.p. over the year. Select the link “Regional Monthly Data - October 2010” which will prompt you to unzip a folder of Excel files. Then select the file “LMSScot0910” to access the data.